Think of a sponge in a dish of water. The more water in the dish, the more the sponge expands. The less water, the more the sponge shrinks until it becomes dry and brittle. The sponge, of course, is the wood in the piano. The dish is the room, and the water is the humidity in the air of the room. Now attach a string from the end of the sponge to the side of the dish. As expansion or contraction of the sponge takes place, the string becomes taught or slack; just like the stings in the piano. As this happens the tuning goes up and down in pitch. Obviously, the more consistent one can keep the moisture level, the more consistent the tuning will stay and also the longer the piano will last. It is not too much or too little humidity which causes problems, but the extremes of going back and forth when the heat comes on and off in seasonal climates such as the northern United States. A constant high or low humidity is in actually easier to deal with than these wide swings. On a rainy day the humidity can get up to 100% and on a dry winter day it can get down to 20 or 30% in a heated house. 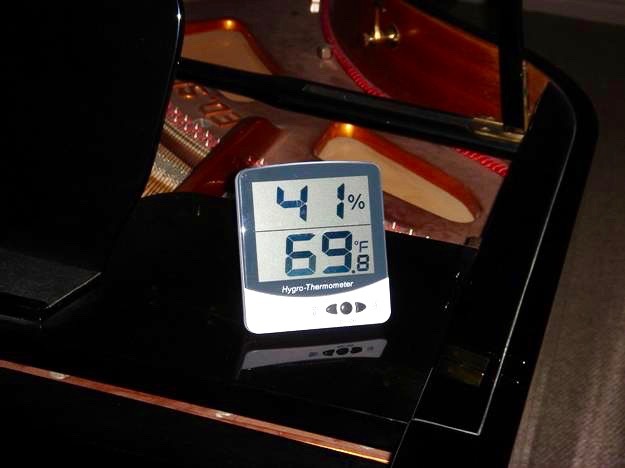 The ideal humidity for a piano is 35 to 45% (or 42% with a temperature of 68 degrees, if you want to get precise). Hygrometers are devices which measure the humidity. These can be purchased at a hardware, department or electronic store. There are needle and digital types and some are more accurate than others, so you need to beware of the really cheap ones. Also, be sure to get one that measures the relative humidity (humidity relative to the temperature). Your technician may be able to recommend a good one. Humidifiers are used mostly in the winter to add moisture to the air. An adequate humidifier is the kind that is a part of a forced air system, however be aware that these can be quite inaccurate. Many, unbeknownst to the owner, aren't working at all. If you don't have forced air, the next best humidifier, is the portable type of which there are many sizes and styles available. Although they can be quite noisy, they can be placed in the room near the piano and monitored for a while until you get a fairly constant humidity level. It is best to get a large enough tank for when you go out of town. It's also a good idea to get one with a humidistat, which automatically turns the humidifier on and off when it reaches the proper humidity level. Avoid ultrasonic humidifiers, as they can cause health problems and white dust. Clean your room humidifier once a week or so with bleach to avoid health problems and add bacteriostatic solution (easily obtained from your local hardware store) to keep down bacteria growth. Air Conditioners and Dehumidifiers are a good idea during the Spring and Summer to keep the moisture down if you have a problem with excessive humidity. Again, consistency is the key. Piano Life Saver - a complete humidity control system (see next page).